DOWN PAYMENT / ADVERTISED PRICE / RETAIL PRICE IN THIS AD DOES NOT INCLUDE TAX, TITLE, PLATES AND DEALER FEES. THESE WILL BE AN ADDITIONAL COST. THE FEES WILL VARY WHETHER YOU DO FINANCING, BUY HERE PAY HERE OR CASH. IT WILL ALSO DEPEND ON WHERE YOU LIVE. PLEASE CALL US AT 724-437-5274 FOR MORE DETAILS. HOME OF THE 100% GUARANTEED CREDIT APPROVAL! EVERYBODY GETS APPROVED! THE DOWN PRICES ON THIS LISTING MAY VARY DEPENDING ON A PERSONS CREDIT OR INCOME VERIFICATION. FOR THE FULL RETAIL PRICE PLEASE CALL OUR DEALERSHIP AT 724-437-5274. LBSI AUTOMOTIVE IS NOT RESPONSIBLE FOR TYPOGRAPHICAL ERRORS. PUBLISHED PRICE SUBJECT TO CHANGE WITHOUT NOTICE. ALL FEATURES AND EQUIPMENT LISTED MAY NOT BE ON VEHICLE. PLEASE VERIFY ACTUAL OPTIONS WITH INTERNET DEPARTMENT BY EMAIL OR PHONE. IF YOU ARE COMING TO OUR OFFICE AND PLAN ON PURCHASING A VEHICLE PLEASE BE HERE TWO HOURS PRIOR TO CLOSING. PLEASE SEE OUR WEBSITE FOR HOURS AND TIMES AS THEY MAY CHANGE. WE DO NOT STAY OPEN AFTER HOURS AND CAN NOT GET YOUR CAR TITLED AFTER HOURS. WE DO TAKE CASH IN PERSON, VISA AND MASTER CARD ONLY FOR A CERTAIN AMOUNT (PLEASE CALL FIRST) CREDIT CARDS WILL ONLY BE ACCEPTED WITH A VALID DRIVERS LICENSE AVAILABLE WITH THE SAME INFORMATION ON IT AS THE CUSTOMER MAKING THE PURCHASE. WE LOOK FORWARD TO SEEING YOU SOON. 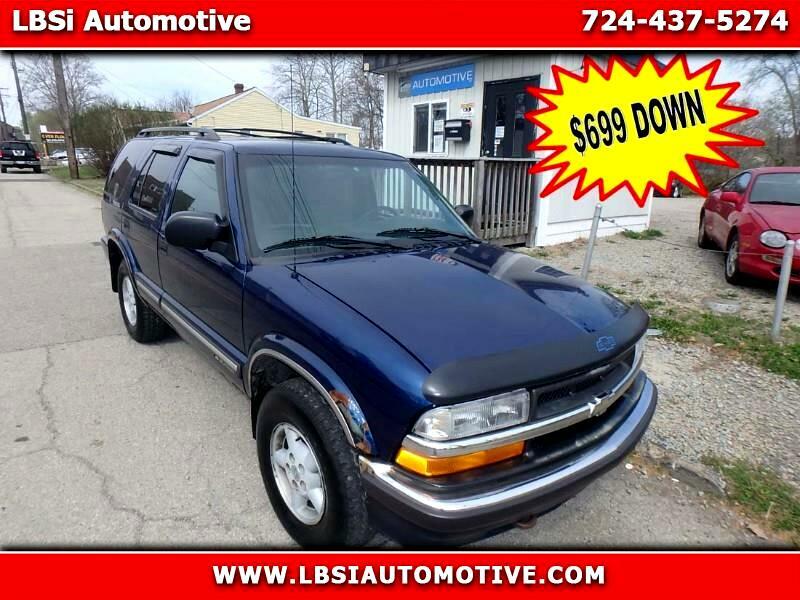 Message: Thought you might be interested in this 2001 Chevrolet Blazer. You promise to pay us the principal amount of $1,799.00, plus a time price differential accruing on the unpaid balance at the rate of 21.00 % per year from today's date until maturity. The time price differential accrues on a 365 day basis. After maturity, or after you default and we demand payment, we will earn finance charges on the unpaid balance at 21.00 % per year. You agree to pay this Contract according to the payment schedule and late charge provisions shown in the TRUTH IN LENDING DISCLOSURES. You also agree to pay any additional amounts according to the terms and conditions of this Contract.